Marvelous Monday…it’s a hot one! – When Will We Cry? Marvelous Monday…it’s a hot one! Last night Eduardo and I dropped the trailer off at the dormi and made it to Malacatan by 9p. With dinner still on the table we joined the team from FBC Shreveport and had a good time catching up. The night was cool making it easy to sleep. We rose at five for breakfast and then made our way to Las Mercedes. 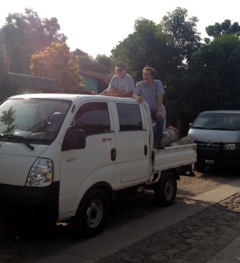 The van could only go part of the way because of the road so we loaded everything in the truck and continued. 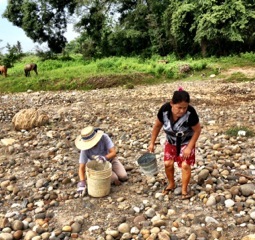 When we arrived we found that the project at Las Mercedes was going well but more rock was needed. When you’re this far out you don’t just pick up the phone an order more rock. You use the resources that are available. So down to the river we go. 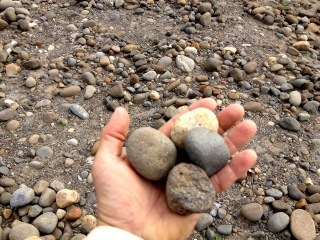 Turns out that just any ole rock wouldn’t do. 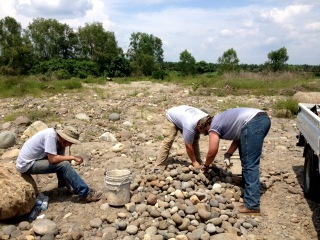 The rocks needed to be a certain size so we plundered through many until we had a truck load of the fine specimens. Ladies from the church came to help as did Bethany and Sarah from FBC. The heat index must have been 120 degrees. 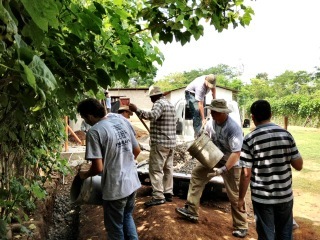 Back at the church the team made quick work of filling the ditch with rock and sand. This will provide some filtration for the water leaving the septic tank. Oh well, it’s not dinner conversation but that’s what it is. 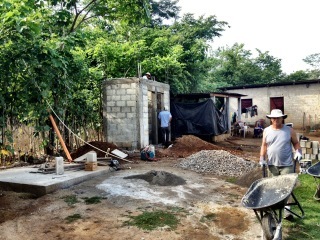 Pastor Epifanio was working getting the bathroom roof ready to pour on Tuesday. By mid afternoon we were beat so we packed and headed in. We needed to pick up two toilets and new paint for the church. Pastor Isidro can’t stop smiling and that warms our hearts.